Charmant, airy studio offers 2/4 sleeping capacity. Now fully airconditioned so you can set your optimal ambiance whether is summer or winter time. Contemporary styled, yet warm and inviting with double sofa/bed, armchair and all new appliances. Large Bathroom with WC and shower corner. Located just 100m from the sea and 300m from sandy beach. Its location offers everything what you expect from holidays on French Riviera within five minutes walk. Bathroom with shower corner, wc, towel dryer and washing machine. Notes on accommodation: Strictly non-smoking apartment. Pets not accepted. Cleaning / Towels / Linen / Maid service: Shower towels, hand towels, beach towels and linen are provided, changed weekly. Cleaning not provided. Vacuum cleaner is part of equipment. If you decide not to clean before leaving an extra cost of 50 euros will be charged. Wir haben uns in dem schön renovierten und gut ausgestatteten Appartment in einem traditionellen Haus sehr wohlgefühlt und waren froh, alles schnell zu Fuß erreichen zu können: einen netten kleinen Stadtstrand, den Yachthafen, die Altstadt und den Bahnhof. Auch Restaurants und Bars liegen quasi vor der Tür, und da ist in der Hauptsaison schon was los. Aber mit geschlossenen Fenstern (und bei Bedarf der modernen Klimaanlage) ist die Nachtruhe gesichert. Thank you for taking the time to review your stay with us. We are very pleased to hear that you liked our apartment. 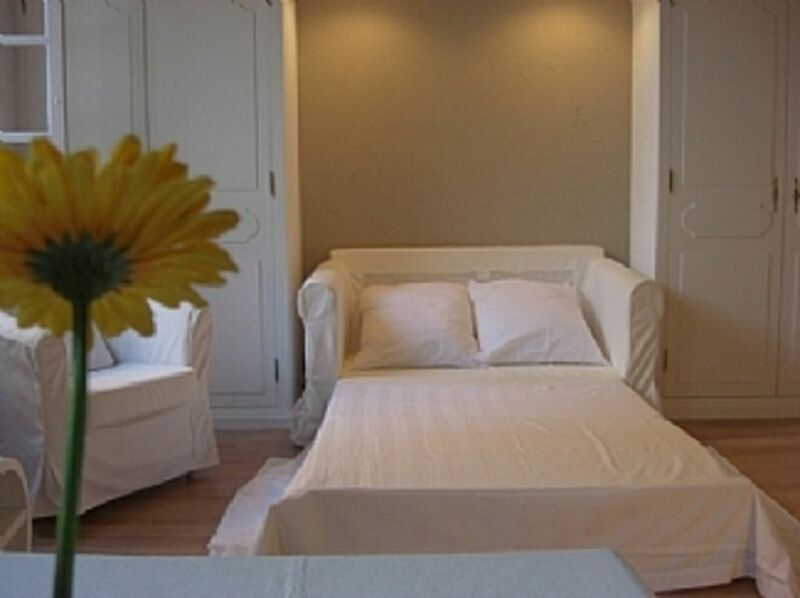 Hope we might welcome you another time at our apartment Le Pescadou. Many thanks for your booking. Port Vauban 100m, sandy beach La Gravette 300m, other sandy and pebbles beaches within 7 mins walk. Car or scooter easy to higher in Antibes. Antibes with its central position is ideal place from where to make discovery trips to all Cote d’Azur area. Cannes 15km, Juan Les Pins 5km, Monaco 45km, St. Paul de Vence 20km, Nice 20km, Grasse 30 km, Biot 5km. Antibes has vast variety of places to visit or enjoy. So everyone can find his way how to spend the perfect holidays. Antibes unique climate is suitable for holidays whole year round, sunny and hot summer, fresh and warm spring and autumn, and mild and bright winter times are equally enjoyable. Marché provençale: every morning except on Monday, in Old town offers flowers, spices, local specialities all that during day, and at the evening - dinner, drink, gallery of local artist and craftsmen in the open air. Le Phare de la Garoupe (lighthouse on Cap d’Antibes), nice 30 min. walk along the beaches of Antibes, and little hike on the hill La Garoupe rewords you with marvellous 360° view over the coast of Cote d’Azure. 14 July at 22.30 – Fireworks at Juan les Pins). Satisfy gourmand needs in hundreds of restaurants or just enjoy evening in one of the local bars and clubs. For more information visit our website below where we prepared lots of tips and web links so you can plan in advance. How to enjoy a time in Cotê D'Azur. If you decide not to clean before leaving an extra cost of 50 Euros will be charged. Key pick up with owner. Owner not present on location. Changeover Day: Changeover day is Saturday. Minimum stay in summer months is one week (from Saturday to Saturday). Check in 14:00 – Check out 10:00.